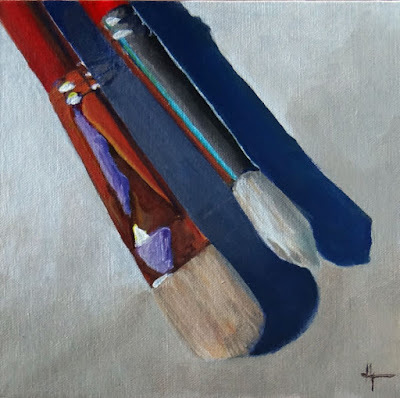 Brushes are the love of every painter... we buy more than we need, we covet them, we accidentally ruin them, we have favorites, we love our brushes. I don't paint much with these two brushes - mainly because they are too pretty. I like the shadows in this painting and the metallic sheen on the ferrule. I am happy with the end result of this painting! I completely understand the concept of your beautiful brushes. I have a few gorgeous pieces of fabric that I love and will never use. Love you my Di! I think it is most likely a trait passed down from generations. I didn't know that you loved your fabric on that level but it makes perfect sense to me. Perhaps it is the purest form of admiration for something beautiful! Love you too Dar.